Backpacking has become a tradition in my family for outdoor adventures. Every year, my wife, the kids and I travel to the closest National Park and spend a few days backpacking through the woods. Being able to enjoy the wonders of nature and at the same time, spending quality time with my family is something that I wouldn’t miss for the world. Having done this quite a few times, I wouldn’t consider us experts, but we’re pretty good at recommending the best equipment that you should bring with you. Being out there all day, setting up camp and sleeping under the stars is a pretty enticing option. But you don’t want to be lugging around a camp pillow that’s bulky or can take up way too much room in your pack. Manufactured in the USA, Therm-a-rest was responsible for inventing the first self-inflating camping mat and they have continued their excellence in quality with the Therm-a-Rest Compressible Pillow. Made with comfortable urethane foam inner material and brushed polyester on the outside makes this an extremely comfortable camping pillow to put your head on at night. It’s this material that also makes the camping pillow compressible to a convenient size for carrying it around all day while you backpack through nature. 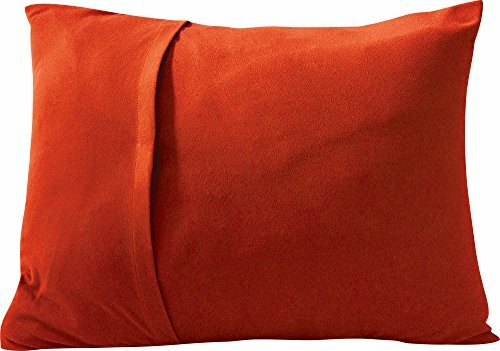 When you expand it to drift off to dreamland, this backpacking pillow opens up to a generous 16.5 x 38 in surface just ready for you to rest your weary head. Hailing from Switzerland, the Exped Air Pillow takes portable camping pillows to another level with this pillow that could be the perfect option if you’re looking for a backpacking pillow that can inflate with just a few breaths. That’s right. 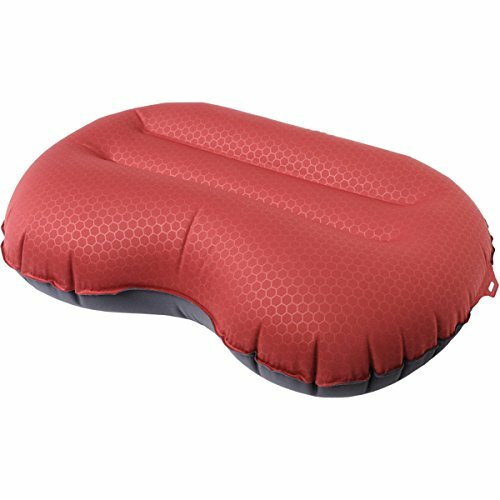 This is one of the best backpacking pillows not only because of its ability to compact very well but because of the comfort that it offers you. Normally, most air inflated pillows either use an uncomfortable material or it’s difficult to get just the right amount of air in so you can sleep comfortably without having to adjust it over and over. But with the Exped Air Pillow, those concerns won’t be on your mind. With 2 FlatValves that are very unnoticeable and a tricot polyester material will make this pillow very comfortable next to your skin. For us, this is our choice for the best backpacking pillow for those looking for a simple option when sleeping under the big bright stars. 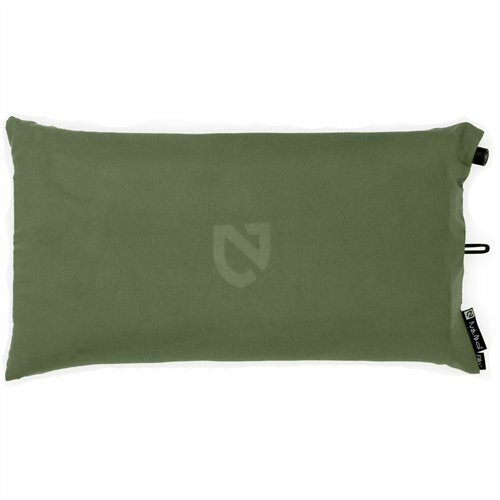 Made from memory foam insides with a polyester microsuede shell, the Nemo Fillo Backpacking and Camping Pillow is our choice for the best versatile backpacking pillow in the group. Being a memory foam pillow adds to the comfort when you lay your head down having the support you would expect. But what you wouldn’t expect is that this camping pillow that weighs less than a pound compacts into an attached stuff sack to make it even easier to carry around. 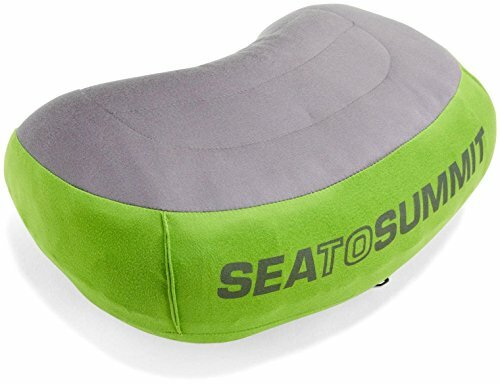 If you’re a fan of memory foam pillows and the support that they can offer, you cannot go wrong taking this pillow with you on your next backpacking adventure. A lot of people have neck issues because of the way they sleep and that doesn’t go away just because you’re out backpacking. The Aeros Pillow Premium from Sea To Summit helps those by providing a backpacking pillow that can help alleviate those pains. With its contoured surface and scalloped edge at the bottom creates a cradle for you head while staying centered over your shoulders, regardless of the position you sleep in. With an extremely soft and tough brushed 50D polyester knit outside and synthetic filling inside, this camping pillow will stand up to you tossing and turning and also wick away any perspiration on those hot summer nights. 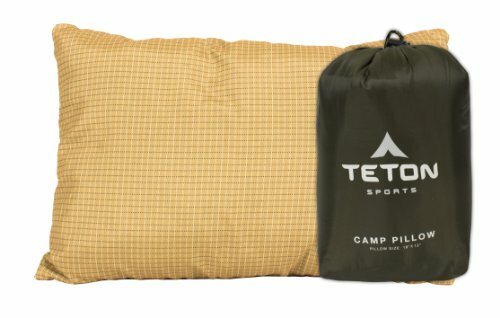 The perfect camping pillow for you if you’re looking for a simple solution nut still want comfort and portability, the TETON Sports Camp Pillow will suit you’re your needs. A lightweight, soft camping pillow that compacts to a carry size of 4x7x9 inches, this pillow allows for easy transportation from campsite to campsite and can still be a very comfortable spot for you head. More economically priced than the other options we chose for this list, this pillow will suit your needs or be the perfect solution for a friend of family member who might forget to bring theirs along. Backpacking is an adventure that anyone can enjoy. Whether you go for one day with your friends from college to catch up on old times, or spend a weekend with your family enjoying nature and roasting marshmallows, the memories you make will last a lifetime.